Liberal and Garden City’s rivalry has always been manifested on the field, and tonight was no exception. Liberal Redskin #17 Eduardo Moreno wasted no time marking the first goal with only 9 minutes into the game. Auden Portillo, #9, followed with another goal in less than 3 minutes later. Goalie, Frederic Gomez struggled to get ahold of the ball and pushed Garden City player #7 Joel Sanchez, giving Garden City a goaled penalty kick. GC player Juan Vicente followed with another goal thereafter. In the second half, Liberal Redskins’ goals’ gradually escalated with Liberal Redskin #7 Hector Mata scoring 2 more goals and #19 Socorro Martinez scoring another. Eduardo Moreno scored the final goal with 17 minutes left in the game leaving the final score at 6-2. Leaving Liberal Redskins with a record of 5-1 and Garden City at 0-5. 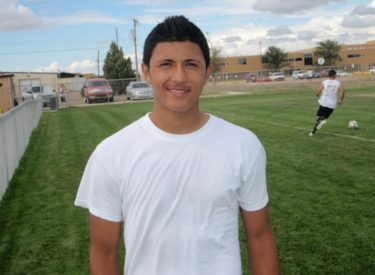 All state forward Eduardo Moreno played in his last game as a Redskin. He is going to play on a select professional team in California. He scored 16 goals for the third ranked Redskins and was an all state player last year. Moreno will return to Liberal to go to school but won’t be eligible to play after playing professionally.